Pink eye or conjunctivitis is an inflammation of the eye that causes it to become red, sometimes itchy, and painful. Although it is often not a serious condition, it can be contagious and bothersome. Depending on the cause of inflammation, pink eye can be treated in various ways. Over-the-counter treatments are available, but it is best to go to an eye doctor for definitive diagnosis and proper treatment. Pink eye that is caused by bacteria is called bacterial conjunctivitis. Pink eye treatment for inflammation caused by bacteria often involves the use of antibiotic ointment or drops applied directly on the affected eye. Antibiotics. Broad-spectrum antibiotics are often used for bacterial conjunctivitis. If you have an underlying bacterial infection that affects other parts of the body, you may need to take antibiotic tablets or capsules. Most common microorganisms involved in this type of pink eye in adults are staphylococcal or streptococcal bacteria. On the other hand, Haemophilus influenza bacteria are more common in children. Eye Culture. Standard antibiotic treatments often work against these bacterial infections. However, if broad-spectrum antibiotics do not relieve your symptoms, you may need to obtain an eye culture of the bacteria, which is done by swabbing the eye and sending a sample to the laboratory for evaluation. Depending on the results of the exam, treatment may be changed and another type of antibiotic may be prescribed. Eye Cleanser. Your doctor may also prescribe a special eye cleanser and artificial tears to relieve other symptoms. Some people who acquire a sexually transmitted disease (STD) may also suffer from pink eye. Newborn babies of mothers who have an STD could also be affected. Gonococcal bacteria from infected mothers may be transmitted to newborn infants during natural birth, causing pink eye. Mothers who may be suspected of harboring an STD should be tested before giving birth to get proper treatment and avoid transmitting the infection to their babies. Newborn babies are often given silver nitrate or antibiotic ointment in their eyes to prevent infection. Babies with confirmed gonococcal infection also need to receive intravenous or intramuscular medications in addition to eye treatments. Other possible bacterial organisms such as chlamydia, staphylococcus, and streptococcus should also be considered before treatment begins. Pink eye in sexually active adults must be carefully evaluated to ensure proper treatment and to prevent spread of the disease. Viral conjunctivitis may improve even without treatment. However, if symptoms persist or worsen after several days, consult your eye doctor for proper diagnosis and treatment. 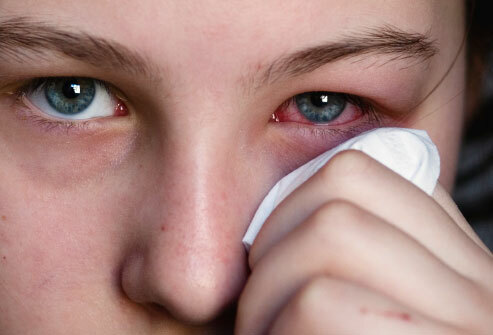 Pink eyes that are accompanied by constant itching are usually caused by allergic conjunctivitis. This condition is characterized by scant, stringy mucous eye discharge, nasal congestion or stuffiness, scratchy throat and dry cough. Symptoms may be persistent (chronic) or on and off. Diagnosis is suggested by the lack of signs and symptoms related to infection or negative laboratory results. Pink eye treatment of this type, is usually directed to control symptoms, and may consist of over-the-counter antihistamine eye drops, vasoconstrictors, or a combination of both. Mild steroid eye drops may be applied temporarily. Eye drop medications with a mast-cell stabilizer may be used to reduce histamine release and itching. People who use steroids for ongoing treatment must have regular check-ups with their eye doctor for increased eye pressure and development of cataracts, which are potential side effects of the drug. Giant papillary conjunctivitis (GPC) is a condition that often affects people who wear soft contact lens, causing pink eye. Eye inflammation is due to the body’s immune response to the contact lens. Symptoms include itching, tearing and mucus production. Both eyes are often affected, and bumps on the inner side of the upper eyelids are usually found, confirming the diagnosis. Treatments include removal of soft contact lenses for at least one month and switching to rigid gas permeable lenses to reduce the risk of recurrence. Strict contact lens hygiene and changing contacts often will help reduce the risk of GPC. Eye irrigation with sterile saline (salt-water) solution several times during the day may also give relief. Mast-cell stabilizers in eye drops may be used by contact lens wearers to suppress the release of histamine, which causes inflammation in the eye. For severe cases of GPC, steroid eye drops may be prescribed. Hope now you have a clear idea of pink eye treatment and will not further delay the cure.